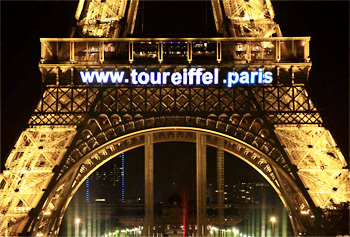 Last night there was apparently a big event for the launch of .paris at the Eiffel Tower (Champs de Mars) and there were plenty of photos shared by the brands, companies and people in attendance. But what's really impressive is that they were able to get the message up on the side of one of Paris' best known monuments — the Eiffel Tower. The City of Paris is behind the domain extension — so that's "how". Of all the different types of new top level domain names that are going to launch over the next year or so I suspect that the ".city" strings are going to be the most successful in terms of capturing mind share. Local Time: Monday, April 22, 2019 11:05 PM PDT – Page Load: 0.2991 Sec.